Due to the customized nature of this product, please allow 2-3 weeks after your proof is approved for your order to ship. A custom pet portrait is a beautiful way to celebrate a beloved dog or cat in your life. Each piece is Made in the USA and begins with a photo of the animal that an artist works from. The resulting digital portrait can be further customized by choosing a color palette to suit your space or a pets’ particular personality. Don’t give it a second thought. Order your Pooch face product and be amazed! Love, love, love the portrait. The picture turned out perfect! I am very happy with this purchase. It was very easy working with these folks and they were very responsive to every question/request I had. 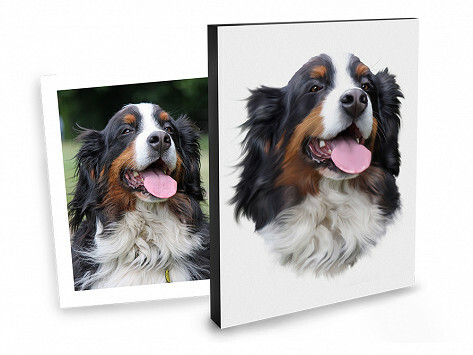 Give your dog or cat the star treatment with a custom pet portrait from My Pooch Face. 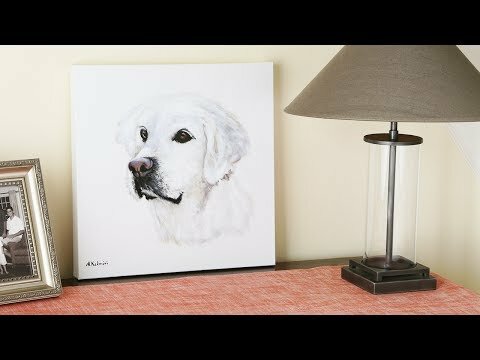 They create works of art that celebrate a pet’s place as a member of the family. It’s a collaborative effort between you and the Georgia-based artists, who work from a photo. (Thankfully, pets don’t have to sit still for these portraits.) The artists capture an animal’s likeness and personality in a polished digital portrait. You can even choose a color theme ranging from a natural palette to brighter hues. A few Grommet family pets had their portraits done, and we were touched by how lifelike and lovely each print turned out. And we liked how engaged My Pooch Face was during the process—even including a sweet note from the artist. Their craftsmanship and care will create a portrait any pet parent will find both beautiful and meaningful.